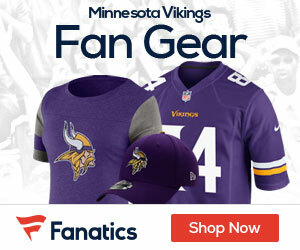 The Vikings hosted a minicamp this weekend in which a “large contingent” of players were trying out with the hopes of landing a contract with the Vikings. Iowa State wide out Marquis Hamilton signed a contract that will keep him on the roster as training camp nears. Hamilton is 6’ 3” and 222 pounds. The other player to sign a contract was Southwest Minnesota State offensive tackle Bill Noethlich. The South Dakota native stands at a whopping 6’ 7”. Seldom do players getting on an NFL team in this fashion make an impact, but despite the long odds you never know when a team has successfully uncovered a secret gem. He’s a good receiver with good hands, but that’s a position where the Vikings have some talent. I think he’ll have a hard time making the team. It’s nice to hear about another big lineman, though. I wonder if he can play Right Guard. Agreed Jazzy, I dont think Hamilton makes this roster. And i’m with ya on the Hawkeyes. what does that say about Perriloux? No news until the rock/river testing is completed. Be patient. ok, ok, I’m with ya……gotta feelin’ with Webb lookin’ like he does, we won’t need Perriloux anyway………BUT, when the rock test shows up on You Tube, please let me know…..very tough for those cameras to get past chilly’s security, but we can always hope…..
Freds does have some inside information that the rock river testing is going on today. In fact this link will show one of Chilly’s double secret QB finds as he approaches the testing drill. damn, chilly even has the QB in disguise……freds, you do have connections, don’t you! thanks for the update…keep us posted! anyone else wonder why we keep signing behomoth linemen to go in a zone-blocking scheme that values mobility? Maybe we either need to modify the scheme and let them bulldoze some folks, or modify the prototype we’re after? Yeah, I noticed he likes the big boys. I assume this is why our pass protection was so much better than our run blocking, we just had bunch of huge assed statues in the way. Why does it seem so obvious to us, but they are making all this money to just sit around to figure it all out? I see Kevin Mawae is still looking for work, wouldnt he be a big upgrade and bring some leadership to the O-line? The Vikings invited multiple players on a tryout (tree-out) basis to a recent rookie minicamp. Three of them — all having ties to Minnesota — have been signed to free-agent deals. The new additions are guard Adrian Battles (Minnesota State), defensive end Cedric McKinley (Minnesota), and cornerback Marcus Sherels (Minnesota). Sherels attended high school in the Minneapolis area, at John Marshall. To date, the Vikings have not signed quarterback Ryan Perrilloux, who participated in the rookie camp as well. The team currently has four quarterbacks on the roster, but one of them presumably won’t be making an appearance until the middle of August, if at all. At some point, the team will need to add a fourth arm for training camp. LA VIKINGS here we come!!!!! Here’s hoping we can get an AFL team. Looks like that’s more of a possibility than keeping the Vikings right now. Is Adam OK? Maybe someone should call a neighbor to check on him! Read the latest PFT news. yeah, saw that latest vote too……..looks like this will go back and forth, back and forth…..I’m no Pawlenty fan! Charlie……the guy thinks he has a chance to be president, which is why he’s thinking about himself more than the state right now…….he doesn’t seem very presidential to me …………………………………………………..on second thought, he looks VERY presidential! Anyways, Let’s hope the Starcaps ruling goes our way, Be nice to have some good news !!! Adam is probably not gone, krugs. The thing is it has been reallyhard for me to think of anything to write on my blog. I’m sure Adam feels the same. Let’s start coming up with some possible AFL names for Minnesota boys and girls. Do they have a draft? I’m here guys. Sorry for the lack of updates, but I have had a crazy week thus far. Was under the weather a bit (better now), had some trips to the doctor (its a boy! ), had a bit of a stadium battle of my own (on a much, much smaller scale), and work is getting busy (the snow is melting). But I have a few hours blocked off now, so I’ll be playing some catch up tonight.